The SAPAP proteins are thought to be adaptor proteins that also interact with different synaptic scaffolding proteins, cytoskeletal and signaling components (3, 4). SAPAP1, 2 and 4 mRNA are targeted to cell bodies, whereas SAPAP3 mRNA is detected mainly in cell bodies (3, 5). 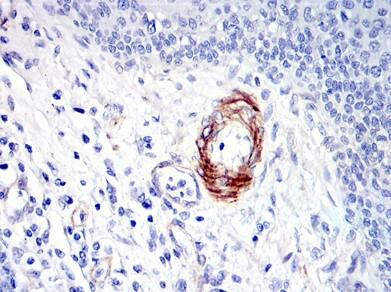 Immunohistochemistry (IHC) analyzes of OPG SAPAP1 antibody (Cat.-No. 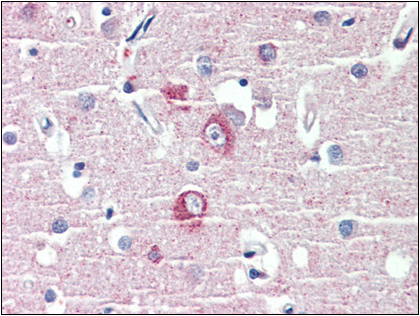 : AP06632PU-N) in paraffin-embedded human brain tissue. 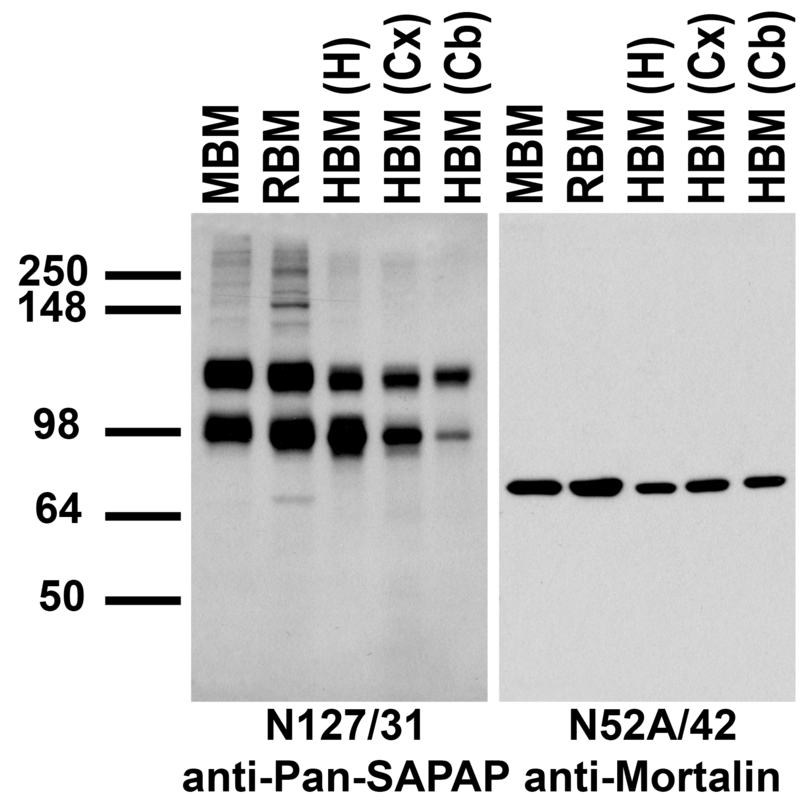 Western blot (WB) analysis of SAPAP1 antibody (Cat.-No. 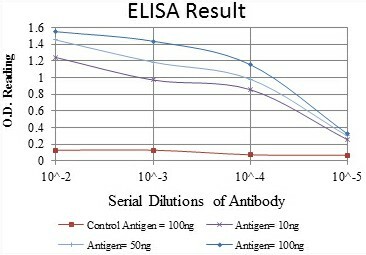 : AP06632PU-N) in extracts from HepG2 cells. 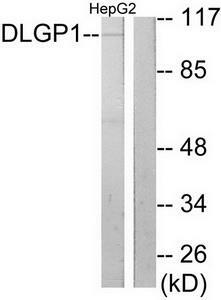 Immunohistochemistry of DLGAP1 in human brain with DLGAP1 polyclonal antibody ( Cat # PAB13040 ) at 5 µg/ml. 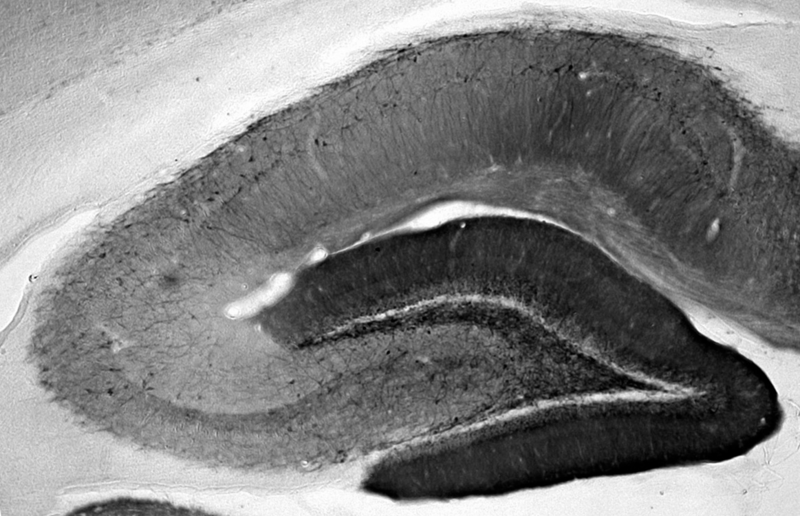 Western blot analysis of DLGAP1 in rat brain tissue lysate with DLGAP1 polyclonal antibody ( Cat # PAB13040 ) at ( A ) 0.5 and ( B ) 1 µg/ml. 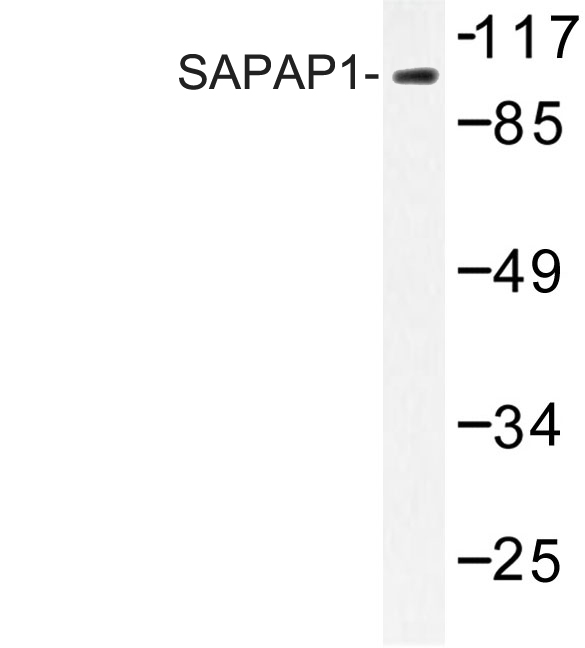 Western blot analysis of DLGAP1 Antibody (N-term) (AP17283PU-N) in MDA-MB231 cell line lysates (35 µg/lane). 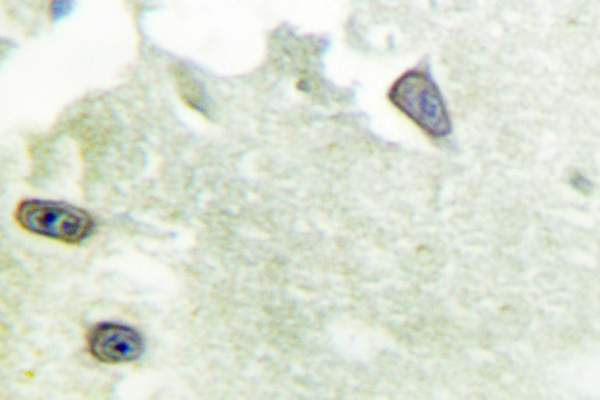 DLGAP1 (arrow) was detected using the purified Pab. 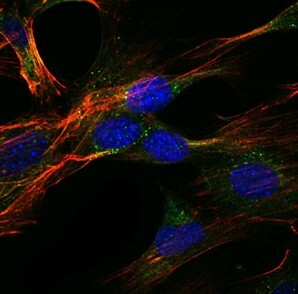 Immunofluorescence analysis of HeLa cells, using DLGP1 Antibody. The picture on the right is treated with the synthesized peptide. 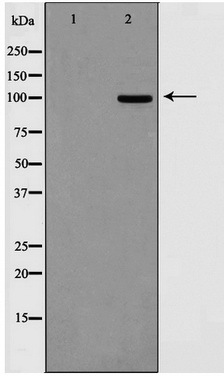 Western blot analysis of extracts from HepG2 cells, using DLGP1 Antibody. The lane on the right is treated with the synthesized peptide. Immunohistochemical analysis of paraffin-embedded human liver cancer tissues using GKAP mouse mAb with DAB staining. Immunohistochemical analysis of paraffin-embedded human esophagus tissues using GKAP mouse mAb with DAB staining. Immunofluorescence analysis of NIH/3T3 cells using GKAP mouse mAb (green). Blue: DRAQ5 fluorescent DNA dye. Red: Actin filaments have been labeled with Alexa Fluor-555 phalloidin. Western blot analysis using GKAP mAb against HEK293 (1) and GKAP(AA: 490-663)-hIgGFc transfected HEK293 (2) cell lysate. 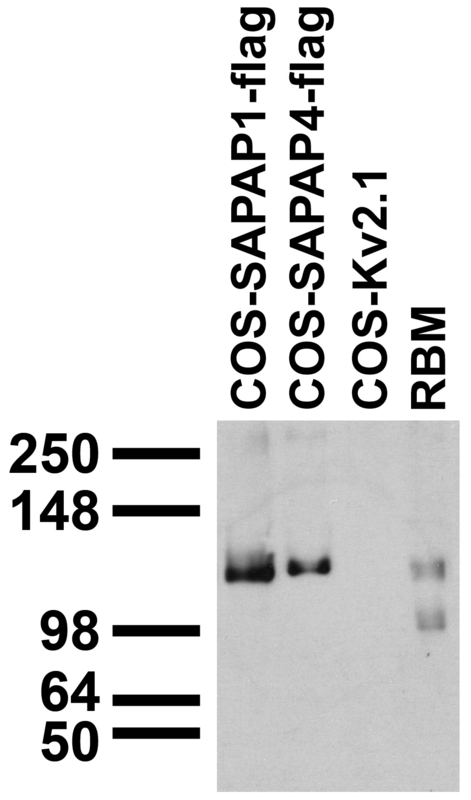 adult RBM and transfected cell immunoblot: extracts of RBM and COS cells transiently transfected with Flag-tagged SAPAP1, SAPAP4 or untagged Kv2.1 plasmids and probed with N127/31 TC supe. Cultured rat hippocampal pyramidal cell (left) and interneuron (right) immunofluorescence staining. N127/31 (Pan-SAPAP) = green, rabbit anti-PSD-95 = red. Image courtesy of Dieter Edbauer and Morgan Sheng, Picower Institute, MIT. 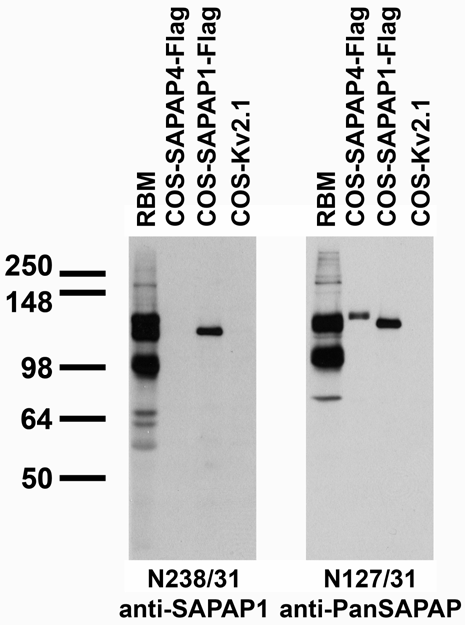 Adult RBM and transfected cell immunoblot: extracts of RBM and COS cells transiently transfected with Flag-tagged SAPAP4, SAPAP1 or untagged Kv2.1 plasmids and probed with N238/31 (left) and N127/31 (right) TC supe. 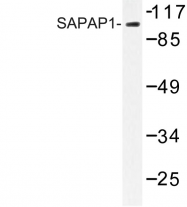 Western blot analysis of SAPAP1 in rat brain tissue lysate with SAPAP1 antibody at (A) 0.5 and (B) 1 ug/ml. 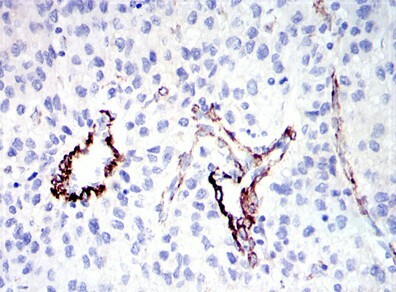 Immunohistochemistry of LIMP2 in human skeletal muscle with LIMP2 antibody at 2.5 ug/ml. 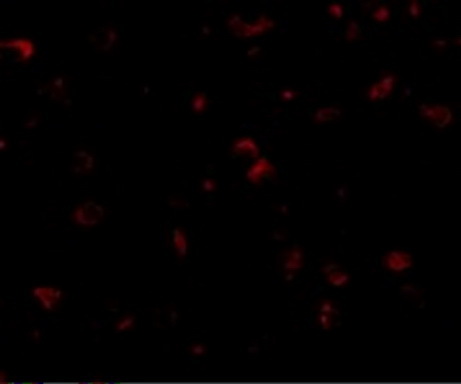 Immunofluorescence of SAPAP1 in Human Brain cells with SAPAP1 antibody at 20 ug/mL. 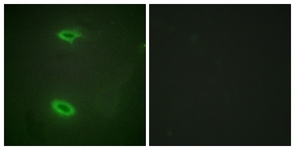 Western blot analysis of extracts from HepG2 cells, using DLGP1 antibody.The lane on the right is treated with the synthesized peptide. Immunofluorescence analysis of HeLa cells, using DLGP1 antibody.The picture on the right is treated with the synthesized peptide.